How do I send leads to a private Slack channel? In order to send leads to your private Slack channel, it is required that the user who initiated the integration is a member on the particular private Slack channel. 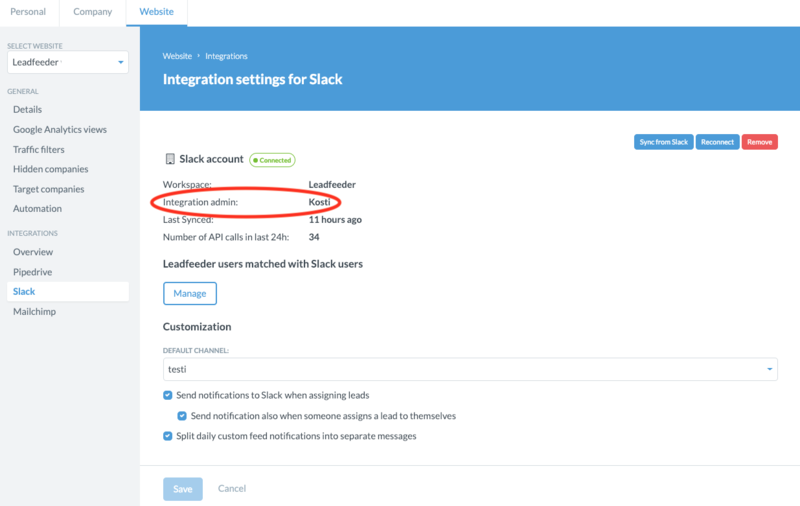 You can see who that member is by accessing your Slack settings in Leadfeeder (here's how to get to those settings) and seeing who is the Integration Admin. Make sure that the Integration Admin user is added to the private channel. Visit Slack settings and click on Sync from Slack to activate the Slack private channel. After that, you can send single leads to the private Slack channel. Also, you can setup Leadfeeder to notify automatically about leads meeting your preset criteria in a custom feed.